This is a 2015 biography from Reformation Trust Publishing. Lawson is the series editor which includes biographies about John Calvin, Jonathan Edwards, John Knox, Charles Spurgeon, Martin Luther, Isaac Watts, George Whitefield, and John Owen. 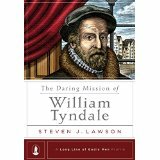 This book falls into three parts: Chapter 1 gives a biography of Tyndale’s life, work, and death. Then Lawson departs from the chronology to give a defense of the five points of Calvinism (chapter 2) and how Tyndale defended each. Then, chapters 3-7 come back to the story and fill in the gaps of Tyndale’s translation work, his constant moving to keep from being captured, the details of his translation method, and then finally his capture and martyrdom. John Foxe called Tyndale, “the apostle of England . . . The most remarkable figure among the first generation of English Protestants.” Tyndale graduated from King’s College, Cambridge only a few years after Luther posted his 95 theses in 1517. Determined to see his English people have a Bible they could read, he vowed, “if God spared him life, ere many years he would cause a boy that drives the plough to know more of the Scripture than he does.” History records that William Tyndale was more responsible than any man in giving us an English Bible. Having fled to the mainland of Europe, Tyndale moved about translating and printing various parts of the Bible as he translated them. These were covertly shipped to England where they were bought up faster than they could be shipped. Tyndale was finally betrayed by a spy and sent to burn at the stake in 1536. His last words were, “Lord, open the king of England’s eyes.” Lawson writes, “Less than a year after Tyndale’s death, Thomas Cranmer, who had become the archbishop of Canterbury, and Oliver Cromwell persuaded Henry VIII to approve the publication of an official English Bible. When King Henry saw the Coverdale Bible, he emphatically proclaimed, ‘if there be no heresies in it, then let it be spread abroad among all the people.’” The Coverdale Bible (first printed in 1535) was actually Tyndale’s translation compiled by Miles Coverdale, Tyndale’s protégé. In addition, another student, John Rogers published his English Bible under the pseudo-name The Matthew Bible in 1537. In 1539 Coverdale issued a revised version called the Great Bible (due to its size) which was approved by the King and commanded to be chained to every Anglican pulpit. Even the King James Bible of 1611 continued the tradition begun by Tyndale and his desire to see the English Bible in the hands of the English people.